Second stay at Antigona's and it was fabulous again. Welcome with a coffee and lots of smiles, Antigona speaks great English and communication was a breeze. Everything in the appartment was great, some cooking possibilities, good heating, best bathroom in town with pressure, consistent hot water and closed shower cabin! Super clean, apples from the garden on the table and Antigona gave us both some Macedonian coffee as a gift on check-out! We were also very lucky that her son Bosko was around on Saturday to drive us to the bus station so that's another thing! Antigona is very welcoming but also discreet and you can interact as much as you want. The property is 20-25min walk from the town center but the nicest way to do it is to climb on the hill where the fort is and it makes for a beautiful morning walk. If you decide to take the main road you have many small shops for diner stuff in the evening. The apartment was so comfortable. It had everything; a wash basin, a dryer, a big terrace, a "sunbrella", enough lights in the room and electrical outlets, the kitchen is fully equipped and not just a few plates and a microwave for heating up: you can actually cook! Bathroom awesome with a closed shower. And the owner Antigona is around constantly making sure everything is OK, clean and organized. Coffee is spontaneously offered, as a ride to the bus station by one of the sons (Boshko: thanks very much for offering!). It's Macedonian welcome at its best. A real family business run with passion and pride. Close to the beach, has a balcony, sells drink, friendly and helpful staff.. They made us to feel at home. Really clean and comfortable place, we had everything that we needed it, even they invited us coffee, tea, fruits and drive us to the center. I highly suggest this apartment. The facilities were really good and the apartment was really clean. The owner, Antigona, was super kind and always trying to make our stay very comfortable. We had a car and no problem with the parking. The neighbourhood is quiet and without any problem during the night. You can walk easily to the very center of Ohrid in just 15 minutes, which is perfect because you do not have all the noise of the center and you just can walk. Really good also if you have kids or for a group of friends! 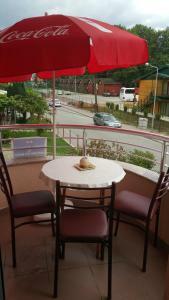 Antigona is wonderfull and very carefull host, the place is very clean, location is great. We couldn't be more satisfied. Loved to stay at her place!! We came to Antigona's apartment for the second time (first time was two years ago). Antigona is an excellent host. The apartment is very clean and comfortable. You have a public beach 2-3 minutes from the apartment, and the city centre is 10 minutes away by foot. (Taxi for 150 DEN). 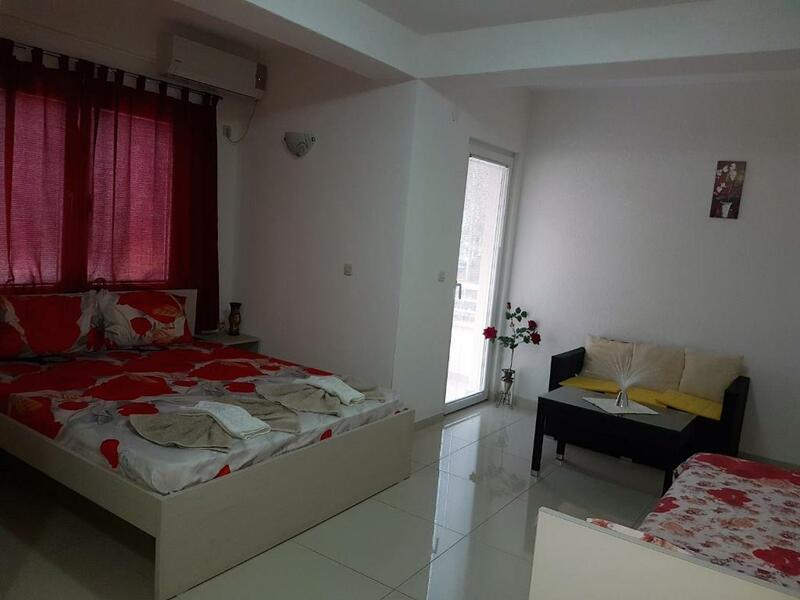 We really recommend this apartment and if we will be travelling again to Albania/Greece, we will stay again at Antigona's apartment for transit. The apartment is clean and comfortable. Beds are comfortable. There is a little balcony with a table to have breakfast. There is a little kitchen to cook something. Parking place is in frount of the house and safe. The apartment is 2 minutes walk from the beach. We had possibility to swim in the lake and came back to the apartment to have a shower in the day of our day-out. Great place to stay in Ohrid. Better than we expect. It was very clean and confortable. We had all we need! Thank you Antigona for everything! Lock in a great price for Apartments Antigona – rated 9.5 by recent guests! Apartments Antigona This rating is a reflection of how the property compares to the industry standard when it comes to price, facilities and services available. It's based on a self-evaluation by the property. Use this rating to help choose your stay! 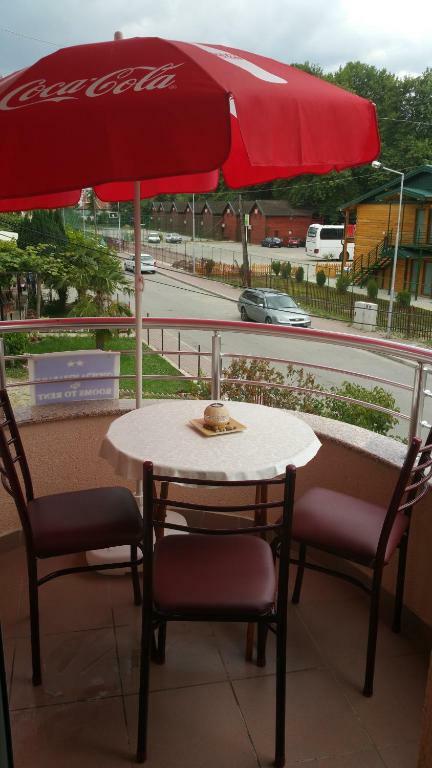 Just 150 feet from the lake, Apartments Antigona is located 0.9 mi from the UNESCO-listed Ohrid’s center. It offers self-catering studios with a furnished terrace and free Wi-Fi. A garden with barbecue facilities is at guests’ disposal. All studios are air-conditioned and consist of a fully equipped kitchenette, cable TV and a private bathroom. They come either with lake or garden views. The nearest restaurant is just 350 feet away, while a grocery store can be reached within 650 feet. A local bus stop is 1,000 feet from the property. Guests can explore the Old Town full of sights such as the ancient theater, Samuil’s Fortress and the medieval Saint Panteleimon Monastery. The Main Bus Station is 1.9 mi from the Antigona Apartments. Ohrid Airport is at a distance of 4.3 mi. Free public parking is possible at a location nearby. When would you like to stay at Apartments Antigona? House Rules Apartments Antigona takes special requests – add in the next step! Please inform Apartments Antigona of your expected arrival time in advance. You can use the Special Requests box when booking, or contact the property directly using the contact details in your confirmation. Everything was over our expectations! 15-20 min by foot to the city center, but thanks to it there where only a few people on the beach. Peacefull neighbourhood, close to the beach, good views on castle. For people who do not like hard mattresses it might be the problem but it is something typical for Macedonia because wherever we stayed the mattresses were hard. We spent there 2 weeks with our 10 years old daughter and it was amazing stay. Location of Antigona: walking distance to the old town, almost by the beach, a few metres to local markets, quiet area, safe at night. Guest house : very clean, nice patio with tables to sit outside, to have something to eat or to relax, each room has got a balcony with table on it so we had our meals there every day, parking next to the building. Room: spacious with well equipped kitchen anex, You can cook the whole meal as there are all the kitchen utensils available and if you need something really special the owner will bring it asap. The furniture is new and modern. Bathroom is also big enough to have a shower and to help kids with the bath. Air condition works perfectly. WiFi is ok: three of us used it and we didn't have any problems. Sometimes it was slower, sometimes faster but generally it was ok. You can always buy some cold drinks from the machine in the hall for the regular price. 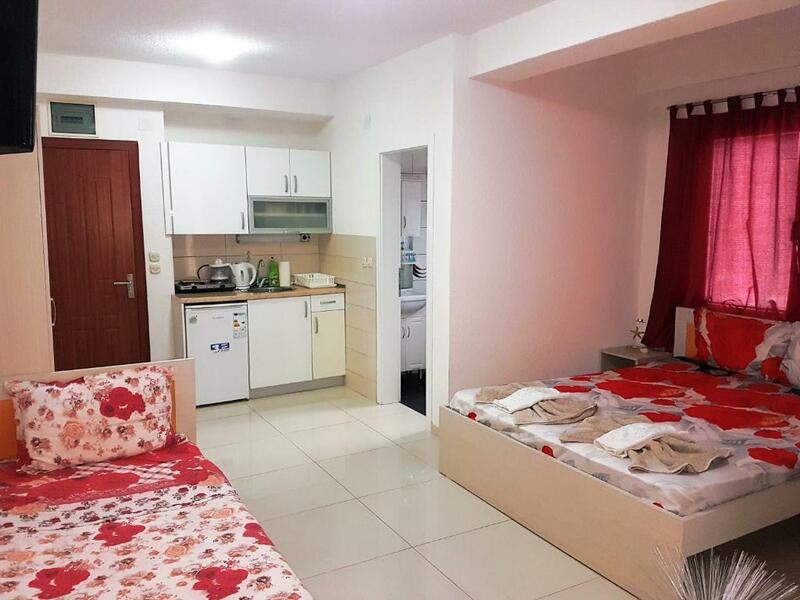 Cleanless: It is very clean place-not only the room but the whole house and we had also towels and bed sheets changed during our stay and room cleaned like in a hotel. The owners: very nice, hospitable people who really care about their guests and all day long are ready to help. Beach: it is not special but ok : the best beaches are located 5 -15 kilometres far from Ohrid but lake is very clean and water warm everywhere. The location is very good, very quiet and clean and close to the beach. The owners were very friendly and helpful. We were under the impression that we were supposed to get 2 rooms for 5 people, but there was only 1 big room. However, I don't think it was their fault and it was just a misunderstanding. I would definitely recommend and stay there again. Very clean and comfortable apartments. Big variety of facilities and very warm welcoming from the kind host! Strongly reccommend! Kitchen is not equipped well. Beds are not comfortable. Bathroom is not good.